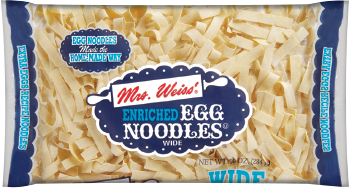 Old-world texture and flavor are the hallmarks of Mrs. Weiss'® Noodles, the way you remember them! Enjoy all our noodle products in weeknight meals or in special occasion dishes. FLOUR (WHEAT), EGG YOLKS, OR EGGS, NIACIN, IRON (FERROUS SULFATE), THIAMIN MONONITRATE, RIBOFLAVIN, FOLIC ACID.